With a trailhead close to town, and access to excellent views from above the treeline, Gavan Hill is one of the more popular trails in Sitka. It is well known locally for the abundance of steps that were put in place to help control trail erosion. In winter the snow can be quite deep along the trail, especially above the treeline. This trail is close to downtown. Follow Baranof Street up past Market Center and the Presbyterian Church to where it ends at a cememtary. 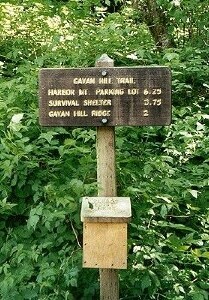 The trailhead has a small parking lot near the cemetary. Muskeg habitat along the early part of the trail. Excellent views from Gavan Ridge.